I am sure most of you have downloaded the PES 2011 demo version. I am interested to find out your views on the new version. So drop me some comments and let me know! This post is sort of an update to my previous PES 2011 post. After writing the last post, I have discovered a few more options to utilise in your game plan. They are the same options as in previous PES version. I decided to post them for the benefit of those who were probably too excited in trying out the gameplay to explore the gameplan settings fully. Move your cursor to a player. Press X/Square on your controller. You should see the screen below. Just like previous PES version, you can choose different roles for a player in the position they are in. 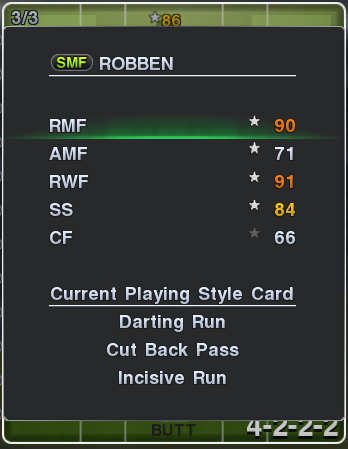 In this case, Robben performs best in the RWF role. Skill cards are still present in PES 2011. Robben has Darting Run, Cut back pass, and Incisive pass. You might notice that some positions have a highlighted star while others do not. 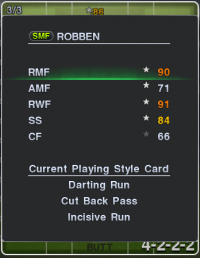 When Robben is deployed as a CF, he will not have a star. This signifies that his skill card will not be in use when he is deployed as a CF. Thus, always select a role with the highest rating, and one which skill cards can be applied. You can select the captain for your PES team in this menu. That should be straightforward. Next we move on to.. When I first tried out PES 2011 demo, I thought PES had removed the mark settings, before I found this option. Thankfully, they did not. I find it important to mark the best player in every match. This will minimize their influence in the game. Ensure you choose a marker in a position closest to the player to mark. However, do not mark more than 2 players as I find this will mess up your defence. In this case, I choose LB Lell to man-mark SS Messi. I will also mark Ibrahimovic with a CB. 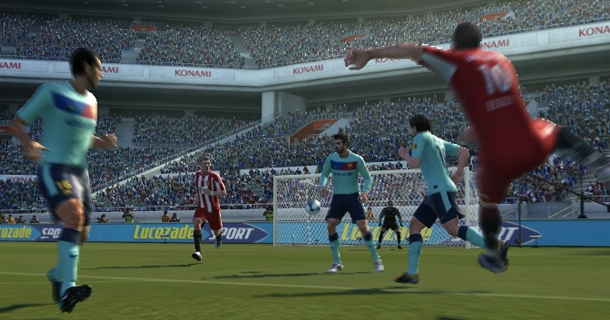 PES 2011 is designed to provide gamers with the ability to make accurate through passes. In this new version, through passes has increased in importance. Accurate through passes can now be played to split the defence to cap off a great team move. I believe when we master the art of through passes in PES 2011, we will be able to dominate the game. In the PES 2011 demo version, majority of my goals are from through passes. Here’s one of them. In addition, I would like to share with you one of my favourate ways to score; curling into the far post. With a left-legger on the right flank, cut in into the edge of the box and let fly a shot towards the far post. I assure you the end result will be satisfying. Here’s such a goal by Robben. Now we eager await the release of PES 2011! Can i ask…why is it when i go to the corner and press the cross button…why will the player kick the ball straight ball out instead of crossing it to the box? When i start to play…when i press the cross button it did go to the box…but somehow all of sudden i played last time…this thing started to happen..when i press the cross button…the player just kick the ball straight out? Let me look into it and I will give you an answer soon! how do u curl a shot? For me, during shooting, i will usually press 2 directional buttons, charge up the shoot button, and release one directional button before releasing the shoot button. For E.g, I hold down Up and Right, charge up shoot button, releases Up, and releases Shoot, while still holding down Right. This makes the ball curls right. Perhaps you can give it a try Sameer? What console/platform that you used to play PES 2011? The graphic looks so sharp & impressive. I use PS2 console at the moment. I guess PS3 or XBOX will be more impressive! What I do is, I hold down two buttons, such as up and left, and charge up power. Just before I release the shoot button, I release one of the directional button e.g Release up, while still holding down left. The curl works better for shots that are weaker. For powerful shots, curl are rather minimal. Sometimes, the ball travels in another direction altogether. That is one problem with PES 2011 haha. I have a weird problem. When I play PES-2011, I’m unable to play with the entire team. I can only select one player from the team and they don’t even pass me the ball!!! I just keep running on the pitch!! how do I call for pass and all??? Can you make sure you are NOT playing in the Become A Legend mode? hELLbOY’s ‘assistance’ in the controls might be ‘Fixed’ and not ‘Auto’ or ‘Semi-auto’. Just a probability.